Image caption Bernice King said her father would be "extremely disturbed by the current climate"
The daughter of civil rights icon Martin Luther King has rejected a claim that the civil rights icon would have been "proud of" Donald Trump. Steve Bannon - formerly President Donald Trump's top strategist - told the BBC Mr King would have approved of the US president's economic policies. Bernice King, however, said Mr Bannon had "dangerously and erroneously co-opted my father's name". Instead, she said her father would be "extremely disturbed" by recent events. 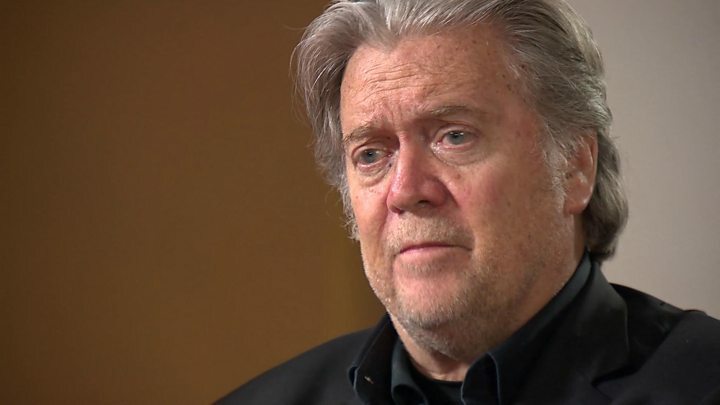 Mr Bannon was speaking to the BBC's Newsnight programme when he said: "If you look at the policies of Donald Trump, anybody - Martin Luther King - would be proud of him, of what he's done for the black and Hispanic community for jobs." He was challenged by the BBC's Emily Maitlis, who asked: "You think Martin Luther King would be proud of Donald Trump?" "You don't think Martin Luther King would sit there and go: yes, you're putting young black men and women to work?" Mr Bannon replied. "The lowest unemployment we've had in history, and wages are starting to rise among the working class, and you finally stop the illegal alien labour force that's coming in and competing with them every day, and destroying the schools and destroying the healthcare? Absolutely." His remarks quickly spread across the Atlantic, playing on US national news networks. 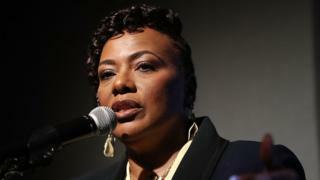 On Twitter, Bernice King - who is also chief executive of The King Center - said the idea that her father would have supported Mr Trump ignored many of Martin Luther King's values. It "wholly ignores Daddy's commitment to people of all races, nationalities, etc. being treated with dignity and respect," she said. "My father's concerns were not sectional, but global. He was an activist for the civil rights of Black people in America, but he was also an activist for human rights." She said her father would not use "degrading" terms like "illegal aliens" - and would never "pit one group against another in the struggle for justice, as Bannon attempts to use him to do". "My father would be extremely disturbed by the climate created by leaders, who have emboldened people to easily express and demonstrate cruelty, predominantly toward people of color and immigrants." Mr Bannon was, until August 2017, the chief strategist for President Trump. That relationship soured, however, with Mr Trump saying in January that his former aide had "lost his mind". Mr Bannon stepped down from his role at the right-wing Breitbart News, where he built his name, shortly afterwards. He continued to court controversy, however - telling supporters of France's right-wing National Front in March to "wear" accusations of racism "as a badge of honour".